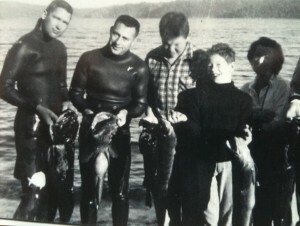 Vern Morgas remembers the early days of scuba diving in Puget Sound. Prior to the 1940s, if you wanted to explore the waters beneath Puget Sound, you might have used a Jules Verne-style diving suit, complete with giant helmet and air tubes. Either that or you held your breath. All that changed when Jacques Cousteau co-developed the Aqua-Lung and ushered in the age of modern scuba. Divers began exploring marine waters worldwide, and it wasn't long before a few intrepid souls began venturing into Puget Sound. Vern Morgas of Shelton, Washington is 87 years old and was one of the very first. "They were shooting at Orcas"
Morgas learned to scuba dive in California after World War Two and bought his first air tank and regulator directly from Cousteau himself. After his inaugural dives in Puget Sound, he became a scuba instructor and eventually taught and certified more than 2,000 divers. Additional media: Read a history of scuba diving at marinebio.org.